Steve Wilkes, Andy Sparks, and I headed north to Grand Rapids, Michigan, to attend the National Homebrewers Conference. On the Wednesday before the conference, we took a side trip to Kalamazoo for a bit of beer exploration. The Kalamazoo location of Arcadia Brewing has only been open since early May. The parent brewery is in Battle Creek and has been in operation for 18 years. In addition to the tasty English-style-based beers, the dining area features a meat counter, where the similarly intoxicating aromas of smoked meat filled the room. As we were sampling a flight (or two) of ales, Brewing Manager Vaughn Stewart joined us and then treated us to a tour of his facility. Arcadia Kalamazoo boasts a five-vessel, 50-barrel brew house, but it’s not the hot side of the operation that piqued our interest. All the beers are brewed at Arcadia using open fermentation. 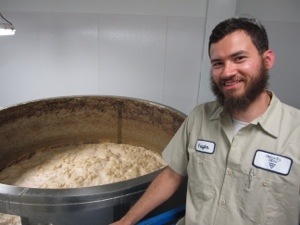 “Our fermenters are basically large stainless steel buckets with no lids,” says Vaughn. This is a bit of an understatement. 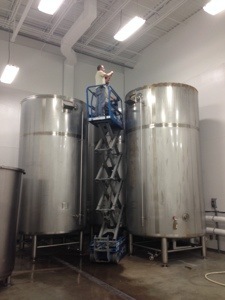 These “steel buckets” have to be accessed by using a scissor lift that raises brewers about 25 feet into the air. It’s a system inspired by Peter Austin, whose Ringwood Brewery revived the craft beer movement in England in the late 1970s. The yeast that Arcadia uses is also a Ringwood strain – or at least that’s what it started off to be when it was first pitched at the brewery around 825 generations ago. Each batch of beer is pitched with yeast from a previous batch of beer. This is the way beer used to be brewed. However, Arcadia employs modern techniques to ensure they’re on the right track. As fermentation begins, the yeast rises to the top, bringing with it hops, trub, and other material. This first wave subsides, and a second yeast rise happens as fermentation gets more aggressive. After more attenuation is completed, some of the yeast will start to settle or flocculate. It is at this point that the yeast is cropped or harvested from the top. Collecting the yeast is extremely low-tech. A plastic bus tub attached to a stick is used as a scoop, and the yeast is collected into a trash can (which, of course, has never seen trash). Proper sanitization is key. About 20 to 25 kilos of yeast is collected per vessel. If the yeast isn’t going to be used within a few hours, it is refrigerated to stop activity without losing viability. If the yeast isn’t used within 72 hours, it is discarded. 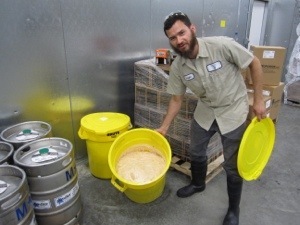 Yeast is not collected from higher alcohol beers. Fermentation temperature is the same batch-to-batch. The yeast is pitched at 67F (19C), and the fermenters are set to 69F (20C). Near the end of fermentation, the temperature is bumped up a couple of degrees Fahrenheit to clean up any diacetyl character. Brewers rely on recipe design, brew house technique, water modification, and oak aging to compensate for not having a greater selection of yeasts to vary their beers. For example, higher gravity beers are pitched with a similar amount of yeast to lower gravity beers. So, the yeast may produce a bit more ester character. Working with a single yeast strain does have its advantages. The brewers get to know the house yeast in the same way a rancher might know his herd. Look for an extended interview with Vaughn on a future episode of Basic Brewing Radio.